The Code Quest is a 3-month long project to wrap up the development of the first public beta release of Blender 2.8. It runs from April 9th to June 30th, 2018 in Amsterdam at the Blender Institute. To learn more visit: https://www.blender.org/2-8/quest . Irfan Celik (irfan) added a comment to T54963: Industry Compatible Keymap. Sorry for being unclear. I meant the Toolbar and Sidebar and according to the menu entry, they are assigned to CTRL [ and CTRL ] which don´t work on my German keyboard layout. It seems the buildbot didn't updated. I've downloaded a new build and it's still the same :( . William, there seems to something wrong with the T and N panel. I can´t seem to activate them via their hotkeys nor drag them out with the mouse. Just with the menu entry and when that is done once, it works using the mouse again yet still no luck with the hotkeys. Pierre Tufenkjian (PiettroJewelry) added a comment to T54963: Industry Compatible Keymap. Hi , for toggle quad view and return in any view shortcut please . Thank you . I didn´t mean the Add menu itself, I meant the search item in the add menu in the node editor. This is the way it is in Nuke, Maya etc. You hit TAB and directly type in what you are looking for. 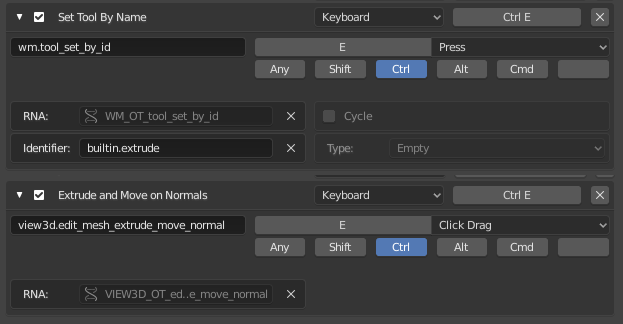 Anyway, if that is not possible, and since shift+A is still used for the add menu in the node editor, wouldn´t it be more consistent to have shift+A for the add menu in the 3d view as well? Hey William, this is a lot better now especially with the middle mouse button. One small issue though. If you want to move the object by 5 units in X, you have to click MMB once, move the mouse slightly then hit X, then 5 and enter. Would it be possible to not move the mouse slightly or would it interfere with something else? Cezary Szadejko (cez) added a comment to T54963: Industry Compatible Keymap. You can now box select while the transform tools are active, just like in Maya. Left-click and drag to box select. Middle-mouse drag to use transform tool outside the gizmo. Brecht Van Lommel (brecht) updated subscribers of T55018: Documentation for 2.8 (WIP). Howard Trickey (howardt) added a comment to T55018: Documentation for 2.8 (WIP). Jeroen Bakker (jbakker) closed T56349: 3D Viewport (parent task) as Resolved. Jeroen Bakker (jbakker) closed T63680: Overlay: Implement Mesh Analysis Overlay as Resolved. Jeroen Bakker (jbakker) closed T63680: Overlay: Implement Mesh Analysis Overlay, a subtask of T56349: 3D Viewport (parent task), as Resolved. When I'm in move tool mode I should be able to box select and deselect everything, keeping the move Tool On. The same is in rotate and scale mode . Jeroen Bakker (jbakker) closed T63857: Dynamic Paint: Remove Preview option as Resolved. Jeroen Bakker (jbakker) closed T63857: Dynamic Paint: Remove Preview option, a subtask of T56349: 3D Viewport (parent task), as Resolved. Zino Guerr (Zino) added a comment to T54963: Industry Compatible Keymap. @TheRedWaxPolice (TheRedWaxPolice) personally i use box select on RMB click drag and hotkeys for transform tools even have cycling transform tools with a hotkey , this way not only i can select but also click drag with manipulators on LMB and they don't interfere with selecting components pretty much like "Right click select".....now when you use selection tools you have to be outside the selected components otherwise it will deselect from the cursor's position especially with "substract". i know this is unorthodox way but i found it much more intuitve and fast the only thing is missing is to be able to toggle transform tools that's all what i am looking for either from the Active tools or the pop-over ones if we can map anyone of them to our own hotkeys then they can both stay since not all of us find this little problem annoying. TheRedWaxPolice (TheRedWaxPolice) added a comment to T54963: Industry Compatible Keymap. why would u need click drag if you are using the gizmos in the first place? Jeroen Bakker (jbakker) added a revision to T63857: Dynamic Paint: Remove Preview option: D4734: DynamicPaint: Remove Previews. Jeroen Bakker (jbakker) updated the task description for T63857: Dynamic Paint: Remove Preview option. No, they are different, With the "real" transform tools you can click and drag anywhere to transform, which is a top feature. The "overlay" gizmos are great to help the tools that doesn't have gizmos, like the selection tools, so you can for example box select and still have the gizmo available etc... They both need to exist. Jeroen Bakker (jbakker) triaged T63857: Dynamic Paint: Remove Preview option as Confirmed, High priority. Jeroen Bakker (jbakker) closed T63819: Overlay: DynamicPaint overlay, a subtask of T56349: 3D Viewport (parent task), as Invalid. Jeroen Bakker (jbakker) closed T63819: Overlay: DynamicPaint overlay as Invalid. Mark this task as invalid as we need to find a solution that will work more generic. Brecht Van Lommel (brecht) added a comment to T56349: 3D Viewport (parent task). I think removing those preview options is fine. We can add a better system to preview such results from modifiers in the future (also for modifier nodes in the upcoming system), but the current preview stuff seems too much of a hack. i want to ask what id the real difference bewteen these two?, wouldn't be ideal to replace the Transform tools with the pop-over ones ,so they can be used with the industry hotkeys and work with other Active Tools epsecially selection tools and i beleive it will even bring 2.79 functioanlity to be easily toggleable....and the pop-over can remain for the other options. Jeroen Bakker (jbakker) updated the task description for T55018: Documentation for 2.8 (WIP). Jeroen Bakker (jbakker) lowered the priority of T63819: Overlay: DynamicPaint overlay from Confirmed, High to Confirmed, Low. @Brecht Van Lommel (brecht) there is a misunderstanding in the second bullet. @Michael Klement (zaha) Instead of adding a modifier key, try using the Click Drag behavior for the operators. For instance, you can keep Ctrl+E (Press) for the extrude active tool and Ctrl+E (Click Drag) for the Mesh -> Extrude and Move on Normals operator. It works really well and is pretty intuitive it also gives the best of both worlds. This is especially nice with the QWERT shortcuts, but wouldn't work as well with knife or loop cut. @Cezary Szadejko (cez) the q key is select in 3ds Max. This is just like the q key in the industry compatible keymap except you can also hit q multiple times to choose your drag behavior in Blender. Paul Kotelevets (1D_Inc) added a comment to T55194: Shortcut Keys Changed in 2.8x. YAFU (YAFU) added a comment to T63819: Overlay: DynamicPaint overlay. Hi. I have no opinion about whether this is better as a new overlay option or from existing Vertext paint option. What I am not sure about is how it would be better for the user, where it allows him to easily realize what he must do to be able to see Dynamic Paint result in solid mode. You remember that in 2.79 this works immediately by default without user intervention, even without having added a Vertex Color layer in the Object Data tab. Well, yep, there were no qiuck wireframe mode (very useful in modeling) and no quick texture (not material) mode. v 2.80.57 seems to behave different - there is also no viewport rendering shortcut. Do we need this as a separate option now that we have vertex color display support? We don't generally do this for modifiers that generate some kind of data. Then you could argue the same should exist for vertex group or uv mapping modifiers, but then it becomes too much.